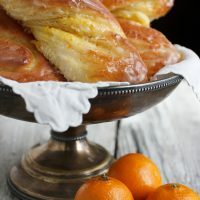 These Glazed Bittersweet Orange Twists have a ribbon of orange rind and sugar running through them, giving them a bittersweet orange flavour, very much like marmalade. The sweet orange glaze is the perfect complement. I debated what to call these delicious buns. 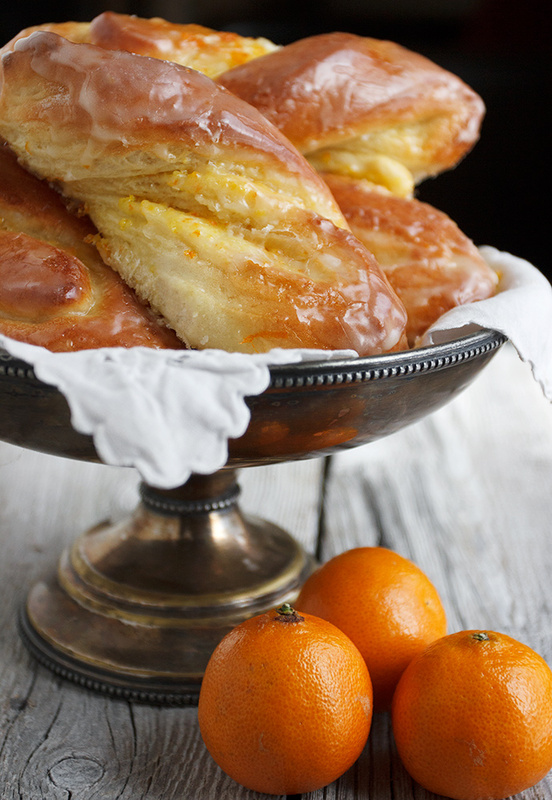 There is no mistaking that the use of the orange rind with the sugar in the filling of these buns creates a wonderful bitter flavour. 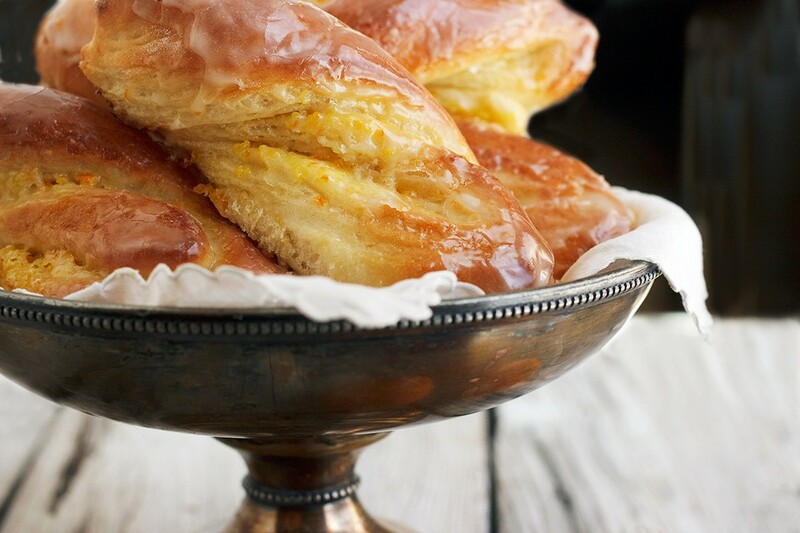 On the other hand, there is the sweet dough, the sugar in the filling and the generous brushing of a sweet orange glaze. So I decided on bittersweet, to give a nod to both sides. Of course, when I say bitter, I mean it in the best possible way – very much in the marmalade way. These rolls are perfect for marmalade lovers! That said, if you’re not a total fan of the bitter, simply reduce the amount of orange rind or substitute orange zest instead. Be sure to check out the Cook’s Notes below the recipe for more tips on making this recipe. Control the amount of bitter in these buns by adjusting the amount of orange rind you use. You could also replace the orange rind with orange zest (probably 1 1/2 – 2 Tbsp. of zest). If using a naval orange cut the rind from the naval orange, rather than simply peeling the orange and using half of it. Starting from the top of the orange, simply cut down the sides of the orange from top to bottom. Don’t slice too thick a slice. Leave a layer of pith on the orange. As the pith is the bitter part, you don’t want to take all of it. Twisting these buns wasn’t difficult. Getting them to stay twisted was a little more difficult :) It helps to press the ends of the twisted dough onto the parchment paper, but parchment paper, by nature, doesn’t really want to hold on to the dough. I ended up adjusting the worst of the untwisting offenders before baking, but for the most part, just embraced their imperfection. (With a bit of hindsight, I might try stretching the dough piece lengthwise a bit before twisting next time. It might loosen it up enough to control it’s urge to untwist). For the prettiest glaze, only glaze the buns once. I had extra glaze left and went over them a second time (hate to waste :). It makes for more glaze, but it does muck it up a bit when you back over it with a second layer. Delicious sweet yeast rolls, filled with a bitter/sweet sugar and orange rind filling. Topped with a sweet orange glaze. These rolls freeze beautifully! For the sweet dough: Warm milk in small saucepan or in microwave to lukewarm (about 115° F.). Add a pinch of white sugar and stir in. Sprinkle yeast over-top. Stir and allow to stand for 5 minutes, until frothy. In a large bowl or the bowl of your stand mixer, fitted with a kneading hook, add 3 cups of the flour, the sugar and salt. Mix briefly to combine. Add the yeast/milk mixture, melted butter and lightly beaten egg. Mix until well combined. Start adding flour 1/4 cup at a time, then a Tablespoon at a time, until dough comes together into a moist, smooth but not sticky dough. Remove dough to a greased bowl, cover with plastic wrap and allow to rise until doubled. Meanwhile, prepare filling by combining orange rind and sugar in a food processor. Process until rind is finely minced. Transfer to a bowl and set aside. In a small bowl, combine egg with 2 tsp. water and set aside. When dough has risen, remove to a floured surface and with a rolling pin, roll into a 12-inch x 11-inch rectangle. On the 12-inch side, lightly mark three 4-inch strips (don't cut all the way through, just mark lightly with edge of knife to make guidelines.). Brush the centre 4-inch strip with beaten egg/water mixture. Sprinkle 1/2 of the sugar/orange mixture evenly over that same strip. Fold the left 4-inch strip over the centre strip. Brush top-side of that strip with beaten egg/water mixture and sprinkle remaining orange/sugar mixture evenly over top. Fold right strip of dough over-top and gently pinch together the left edge and the dough to seal. Using a rolling pin, gently roll the dough lengthwise, just to embed the sugar. Do not throw out additional egg/water mixture. Save it to brush rolls before baking! You should now have a 4-inch x 14-inch piece of dough with two sugar/orange layers inside. Transfer dough to a parchment-lined baking sheet and place in the freezer until firm but not hard, about 10-15 minutes. Remove dough from baking sheet, setting baking sheet with parchment paper aside to use later. Place the dough horizontally on a work surface suitable for cutting. Cut about 1-inch from each end of the dough, to make the dough piece 4-inches wide x 12-inches long. Using the edge of a knife, mark every one inch along the 12-inch length of the dough. Go back and cut dough along the marked lines, making 12 pieces. Take one piece of dough and holding one end in each hand, twist twice by rotating your hands in opposite directions. 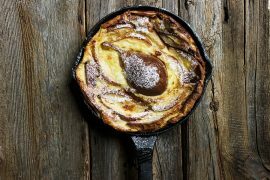 Place each twist onto parchment-lined baking sheet, allowing about 1-inch in between. ** When all twists have been made, cover pan loosely with plastic wrap and allow to rise until doubled in size. Preheat oven to 375° F. When bun have risen, remove plastic wrap and gently brush dough part of buns with left-over egg/water mixture. Place into pre-heated oven and bake until golden brown, about 22-28 minutes. 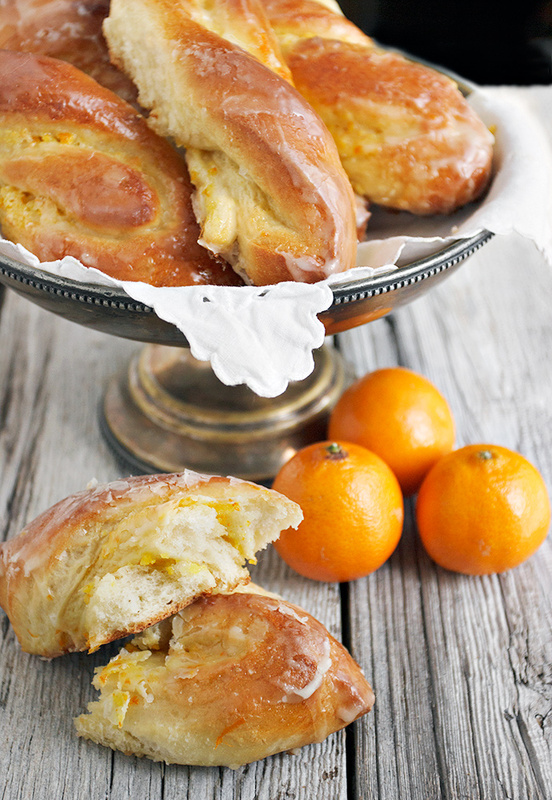 While buns are baking, mix glaze by combining icing sugar and orange juice. Add a bit more orange juice, as needed to create a thin icing. As soon as buns are removed from the oven, remove buns to a cooling rack placed over parchment paper. Brush rolls generously with prepared orange glaze. Allow to cool on rack. These buns freeze well! Defrost covered loosely with plastic wrap, at room temperature. These look absolutely amazing! You’ve made me so hungry! Gosh, your photos are just beautiful! Each and every one makes me want to try the recipe right now! These orange buns sound as if they will become a favorite of mine. Hi Ellen and thanks very much :). I am still enjoying these from the freezer. If you like marmalade you will love these. OMG! These twists look soooo good! And you captured them so fantastically in your pictures! I mean I literally want to reach out and grab one. And that crispiness… dang! Jennifer, thanks for another wonderful recipe. I am wondering if I could replace your filling with a little Saville orange marmalade. Hi Donna! Yes, you definitely could. You probably wouldn’t want too much. Just a thin-ish layer, I think, to keep a nice balance between the bitter and sweet. Thanks Jennifer. My thinking too, just a smidge of marmalade. I’ll let you know the results. Still loving your Chelsea/sticky buns. The best ever! Thanks Donna and can’t wait to hear how it turns out! Hi Jennifer ! I always like all your recipes. This is really overwhelming ! Do you have recipes of donuts which I could use? (Adult kids and grand kids will be over) ? Hi Alice, I didn’t put the rising time, since it can vary so wildly between kitchens (mine is cold this time of year! :) Anyway, as a guideline, in my cool, Winter kitchen, these took about 90 minutes to double. The second rise was only about 30 minutes. Hope that helps. Enjoy! Seriously – I’m with Chris on this one. I think my mouth fell open hoping one would pop in it! These are absolutely beautiful. You are an inspirational baker Jennifer. Truly amazing. Lol Tricia :) And thanks so much. I have to stop looking at this post myself, because there are still several of these in the freezer that are loudly calling my name every time I see the photos! 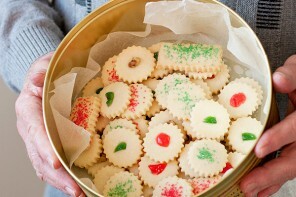 Oh my gosh, my mouth just fell open when I saw these Jennifer. They are incredible!! Drool…..
Oh my goodness these twists look AMAZING! How were you able to get them so crispy and golden! I like the bittersweet taste too!! Thanks Linda. I did brush the dough with an egg wash just before baking, which really helps them bake up nice and golden! 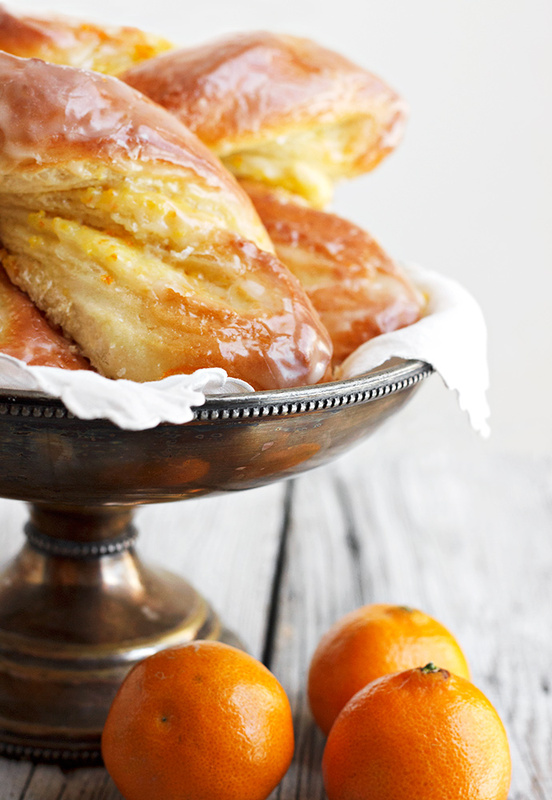 I’m a total marmalade lover Jennifer and these look incredibly glorious! Your photos are fabulous! I want to grab one off the screen! So sad I can’t! Holy Moly, Jennifer, these twists look INCREDIBLE! I am loving the bitter and sweet combination here! I am most definitely drooling over these buns! 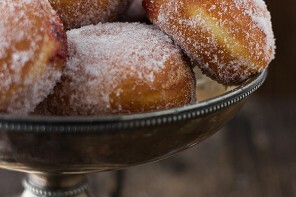 Totally wishing I had a bakers dozen of these for breakfast! I have GOT to make these over the weekend! PINNED! Cheers!